Hall of the Mountain King: Review: Anthrax, "For All Kings"
Review: Anthrax, "For All Kings"
In the 1980s, Anthrax rested, arguably, at the bottom of the Big Four totem pole. When they wanted to be, they could be just as dark, political and technical as their contemporaries Metallica, Megadeth and Slayer, but they were really a different animal. Aside from being the only member of the Big Four not born on the West Coast, Anthrax was made up of a group of oddball guys who liked to have fun and be goofy from time to time. Whether it be a rap song where a band member messed up the rhymes at the end of each verse (“I’m the Man”) or a twangy, Western-inspired ode to Tipper Gore and the PMRC (“Startin’ Up a Posse”), the New York boys didn’t always take themselves so seriously. Perhaps the fact that they were open to doing funny things their partners in crime were not ultimately led some in the uber-serious thrash crowd to not take Anthrax quite as seriously as those other three. When it comes to staying power, though, none of those other bands have been able to hang with Anthrax. 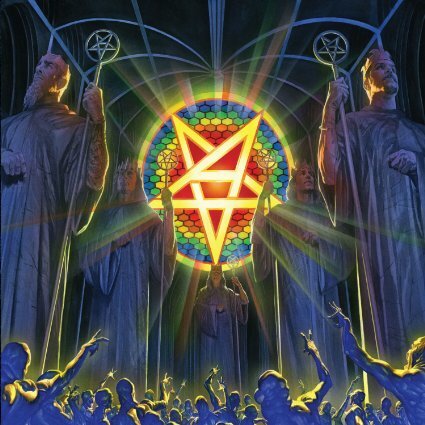 Over the course of their last three records, Anthrax has consistently produced far better music than any of their contemporaries, and I might argue that it’s some of the best music of their career. Though I grew up on the Joey Belladonna version of the band, I’ve made no secret that I prefer the John Bush era. When Belladonna returned a few years ago, I wanted badly not to like the results, but they speak for themselves. Worship Music in 2011 was a phenomenal album, and For All Kings may be even better. I was sold early on in the record with “Monster at the End,” my favorite song in this collection. Why? Because it is, pardon the pun, an absolute monster groover of a song. It leans more toward the Bush-era sound, and on first listen to this record, I spent about half an hour playing it on a loop and hoping there was at least one more like it later in the record. There were several. Another thing that’s monstrous on For All Kings are Scott Ian’s guitar riffs. There are gigantic memorable riffs all over almost every song, ranging from blazing tight thrash runs to huge groovers. Almost every track has a moment that made me want to grab my guitar and figure it out. One of my favorite is the opening of “Suzerain.” Ian delivers a freight train of a riff over some thundering drum work from Charlie Benante, and it’s easily the heaviest moment on For All Kings. The song itself takes a couple of turns, going for a more melodic approach on the chorus that gives us a hook that sticks. “All of Them Thieves” is another favorite with a nasty little riff under the verse that moves to another driving groove on the chorus. “Defend Avenge” makes a similar transition, opening with a somewhat dissonant sequence of guitar bursts before building into another one of those nice grooves. It’s not all about the groove side of Anthrax, though. The first track we got a taste of was “Evil Twin,” one of the weaker songs here in my opinion, which seemed to indicate a move back toward their 1980s sound. There is certainly enough of that to make old school fans happy. Taking it from the top, first song “You Gotta Believe” is ripped right from the classic template and one of the better examples of old school thrash on For All Kings. The album closes there, too, with the angry “Zero Tolerance,” which brings a quintessential thrash sound that will take old fans back a while. Reaching back to their roots again, Scott Ian goes to a well of inspiration that he hasn’t reached for in a while on “Breathing Lightning” – the works of Stephen King. Anthrax recorded a series of really good songs in the 1980s inspired by King’s work, including the title track of perhaps their most revered album Among the Living. For “Breathing Lightning,” Ian turns to the central character of the Dark Tower series, the gunslinger Roland Deschain. It’s also a song that takes a bit of a different turn for Anthrax. The heavy riffs are there, but they’re balanced with some softer interludes and a soaring chorus that might be the best on an album with some very good ones. It’s not the only place where the band dips a foot into fresh waters, though. The title track has a traditional metal undercurrent running beneath the thrash riffing, particularly in Joey Belladonna’s vocal melodies and the chorus. As I sat down to listen to For All Kings for the first time, I hit a whole bunch of particularly tasty moments that I called “DAMN” moments because I’d get this big grin on my face and say “DAMN.” Days later, I’m still having those moments as I listen to this record. The songs provide a great mix of the classic thrash sound and the newer grooving sound. It’s early in the year, but I’d be surprised if this is not my top record of the year when December rolls around. It easily stands with my two personal favorite Anthrax records – Among the Living and We’ve Come for You All – and it’s easily the best complete metal album I’ve heard in several years.